female viagra new drug Emma waking up from her drug induced nap. see url We just got back to the hotel from the hospital and are feeling very thankful tonight! It was a long day of appointments, but we were so very thankful to receive the news that Emma’s scans were not just stable, but showed shrinkage. We almost couldn’t believe what the doctors had said. We know first hand that good scan results are not a given, and we are just so relieved and thankful to have been given good news today. Every day is an adventure in this process and we have learned to appreciate the good ones. http://cinziamazzamakeup.com/?x=comprare-viagra-50-mg-online-generico-a-Roma It was a long day of appointments. We started at 8:30 this morning and left at 5:00. 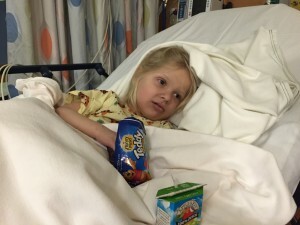 Overall, Emma’s doctors were happy with the results and Emma’s continued progress. We still have a long ways to go with her development, but she is making slow gains. Dr. Ullrich, her neurologist felt that her hip flexors are very tight and are causing her some of the pain and discomfort that we have been seeing on a daily basis. She also recommended that we see an endocrinologist the next time we come for scans to get some baseline information on her growth and hormones. Emma hasn’t put on much weight this year and where her tumor is located could cause growth issues as well as effect how hungry she feels. So we will add that to our list of people to see when we come back in June. lasix iv versus po Dr. Chi, our oncologist was happy with the effect the chemo has had on the tumor and how Emma is handling the treatment. We talked a lot about the rash from the Procarbazine and decided that it would be safest to not give it during the next round of oral meds. She felt that not giving four doses of this medicine would not change the overall outcome of this treatment. The plan now is that we will head home and complete Emma’s last cycle of the TPCV regimen, which means she should finish up in early May. Then we will be at a point that I don’t know that we thought we would ever get to. Emma will get to be done with chemo for a stretch. We will scan again in late June and see how things look. If her scans continue to look stable we will continue to go without chemo until her tumor grows again. It is so strange to think that she could actually make it to the end of a treatment. It has been three years of chemo for her, and it almost seems scary to not be on treatment. However, we are so excited for Emma to have the opportunity to finally know what it feels like to not be on treatment. follow link We are so thankful for the good news we received today and know it isn’t something we can take for granted. The prayers are working! We will exhale a little bit tonight and be thankful for this gift of good news. Then we will be ready to go back to the fight tomorrow, because it never ends. Thank you to everyone who sent messages and said prayers today. We appreciate all of the messages on hard days like today, they help to make the day a little easier. We know that it is all of your prayers and support that have helped to get us here. Thank you for helping us be EmmaStrong!! !